Blueberries are members of the Ericaceae or Heath family, genus Vaccinium, subgenus Cyanococcus. The genus is very diverse, containing 150 to 450 species, mostly found in the tropics at high elevation, but also in temperate and boreal regions. Most are shrubs like the blueberries, but again, a diverse range of growth forms from epiphytes to trees exists. 1. Northern Highbush blueberry (V. corymbosum L.). 2. Rabbiteye blueberry (V. ashei Reade). 3. Lowbush blueberry (V. angustifolium Ait., V. myrtilloides Michx., primarily, but other species such as V. Brittonii and V. Lamarckii my co-exist). 4. Southern highbush (V. corymbosum hybrids with V. darrowi, V. ashei, and other southern Vaccinium species). 5. Half-high highbush (V. corymbosum x V. angustifolium). Cultivated blueberries were domesticated only in the twentieth century, but probably were collected from the wild for thousands of years in North America. Prior to 1900, superior wild bushes were known to be cultivated, supplementing the wild harvested berries. Today, 75-100 named cultivars exist, and new cultivars are being produced annually. The present-day industry in the USA is concentrated in the northeastern states. 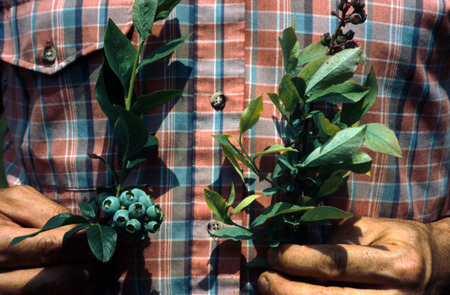 In the southeastern USA, rabbiteye and southern highbush blueberries have become an important crop, having been domesticated only in the last 50 years or so. 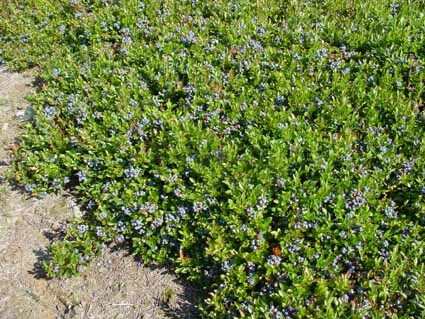 Over the last two decades, interest in blueberry as a crop is increasing in other countries and the western states of the US. Highbush (northern and southern). Erect, deciduous shrubs, to 12′; 4-7′ in cultivation. Shrubs composed of canes which arise from the crown or roots; canes have about a 4 year productive life in northern highbush. Leaves are small (1-2 inch length), ovate or elliptic, with entire margins and acute tips. Rabbiteye. Erect, deciduous shrub to 20′ in the wild, 4-10′ in cultivation. Canes arise from the crown or roots like highbush, but have about a 7 year productive life in rabbiteye. Leaves are similar to highbush. Lowbush. Low-growing (<2 ft, usually 8″), creeping, rhizomatous shrubs. The main portion of plant is rhizome or underground stem, 1 to 3″ below the surface, which produces upright shoots along its length. The uprights grow vegetatively for one year, then fruit in subsequent years. Leaves are smaller than highbush or rabbiteye (½ inch) and have mildly serrate margins. For all species – White or cream flowers (1-16, usually 7-10) are borne on short racemes (1-2 inches), on upper portion of 1-yr-old wood. Flowers are urn-shaped and inverted, on very short pedicels (nearly sessile), with inferior ovaries. 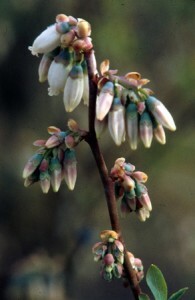 Most northern highbush are self-fruitful, but for some cultivars, higher fruit set and larger fruit can be produced through cross pollination. Southern highbush cultivars, in contrast, are only partially self-fruitful, and are often provided pollinizers in commercial production. Rabbiteye and Lowbush are highly self-incompatible, and must have a pollinizer to set fruit. Bumble bees (Bumbus spp.) and wild bees (e.g., the southeastern blueberry bee Harbropoda laboriosa) pollinate flowers naturally, whereas honey bees (Apis mellifera) are reportedly less effective. In all cases, the fruit is an epigynous or “false” berry. All species require a high degree of fruit set for a full crop (60-80%) – no thinning is practiced. 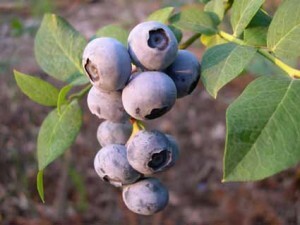 Northern and Southern Highbush – blue-black color; good to excellent fruit quality. Shortest period from flowering to maturity of all blueberries (45-75 days). Rabbiteye – blue-black color; good fruit quality, Fruit mature in about 90 days from bloom, so despite earlier bloom date than Highbush, fruit ripen later. Lowbush -black to bright blue color, fair/poor fruit quality compared to other cultivated types; virtually all commercially grown lowbush blueberries are processed for muffins and cakes. 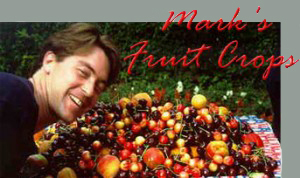 Intermediate fruit maturation period of 70-90 days. All blueberries bloom relatively early, and often experience frost damage. Open flowers of all types are killed at 28°F. Propagation – Hardwood and softwood cuttings are the most popular methods. Hedge height 6-7 ft for mechanical harvest. Blue color is the most often used indicator of maturity. Berries turn from green to pink, and then gradually to a complete blue color, at which time they are ripe. Ripe berries will remain attached for several days or weeks, and sugars continue to accumulate. Berries are picked over several times by hand for fresh sales, and mostly machine harvested for processing. Since berries ripen over a period of weeks, more than one pass with the harvester may be necessary. Lowbush blueberries are harvested by hand rakes, although some mechanical harvesters have been developed. Blueberries are fairly perishable, having shelf life of only 2 weeks when stored at 32 F and 90-95% humidity. Fruit rots like Botrytis, Alternaria, Phomopsis, and anthracnose are major storage problems. Processed blueberries are used mostly in baked goods like muffins, pies, cakes, etc. Juice is a recent innovation, but alone is unpopular. Blueberry juice is too dark and thick for drinking, so is diluted 50%, adding sugar and citric acid back to taste. This juice is mixed with cranberry or other juices (e.g., Ocean Spray products). Per capita consumption is 0.78 lbs/year.